I can't imagine writing without a daily walk outdoors, and Linda Wasmer Andrews wrote a beautiful article for Psychology Today about how walking stirs creativity - "To Become a Better Writer, Be a Frequent Walker." 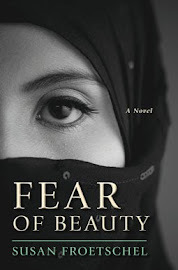 "Susan Froetschel, author of the critically acclaimed novel Fear of Beauty, counts herself among the current generation of perambulating writers. 'As I walk along familiar streets in my neighborhood, I think about my writing and observe my surroundings, gathering descriptions of trees and sky and weather,' Froetschel says. The mental impressions she collects may eventually find their way into descriptive passages in her books." The plots in each my five books includes long walks or hikes, often stressful and a device for making plans, observing foes, or escaping difficult situations. But like me, my characters do their best thinking while walking. 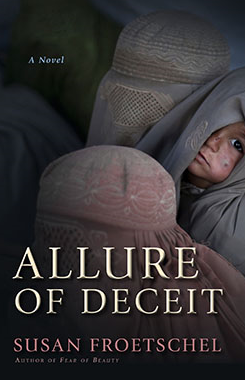 In Allure of Deceit: "Once away from the village, Saddiq proceeded carefully, studying the ground and avoiding the most traveled paths. He deliberate took a meandering route, circling back several times. Empty-handed, he used his hands to reach for trees and tried to pounce on tufts of grass or roots spreading from tree trunks to avoid leaving a trail shold the snow abruptly end .... They planned to walk until the sun came up, and the two did not talk so taht they would other passersby well in advance...."
In Fear of Beauty: "Only because the boy was leaving the next day, I accompanied for him the climb.... Without glancing at the mountain's biggest secret, my hidden garden, I followed Ali, trudging uphill. My shoes were too large, the soles brittle with age, but two pairs of thick knitted socks also protected my feet. Rather than use a path that wiggled around the mounatin, we headed straight uphill through luxurious wavers of grass in gray, gold, lavender, and green. the long strands pulled against my tomban, and rather than push through, I stepped high, toes pointed, to move more quickly.... I glanced up to see Ali happily waving for me to hurry. That memory of his fearless joy is always with me." For me, the walking can be done before the writing or after - and even both. Wasmer Andrews also describes research that offers evidence that walking contributes to creative thinking. 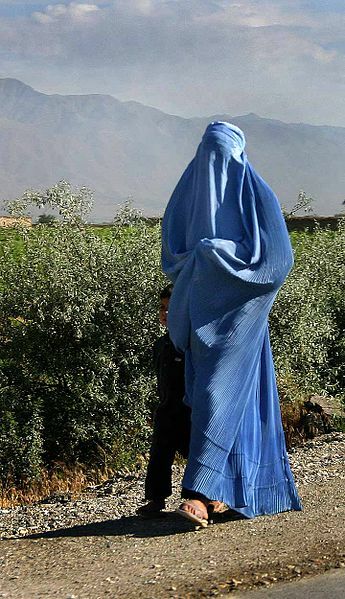 Photograph of a woman walking in Afghanistan, courtesy of Wikimedia Commons.